One of the hardest vendors we’ve had to find is our mariachi. I never realized how hard it was to actually find a decent mariachi. My father is from Jalisco, Mexico and as such it was absolutely necessary to have a mariachi at our wedding. Okay truth be told both my HBoO and I love mariachi music. We decided that since we are going to have our venue for 5 hours we would have a mariachi for 2 hours during dinner and the dj for the remaining time. I began the search by asking relatives and friends if they knew of any mariachis. I soon realized that although I had seen many mariachis in family events people did not keep their numbers around. Since that idea failed I began an internet search. I went onto the Mariachi4U website where you are able to place a bid for a mariachi. I was soon contacted by several mariachis ranging from $200 to $1000 an hour. I kept searching other sites and ran across Gig Masters where you can choose from a variety of musicians. I put in a bid for two different mariachis and received some responses. At this point we had seen several mariachis perform. We went to many restaurants and to the Placita Olvera to see different vendors but they didn’t sound the way I wanted them to. They either sounded out of tune or they did not seem to entertain the crowd. I finally contacted the one from Gig Masters and found out where they were going to perform. We went to see them play and we loved how they entertained the crowd. The only problem I had was that one of the trumpet players sounded out of tune but their director assured me that he was only a sub and would not be performing at our wedding. Yay!! 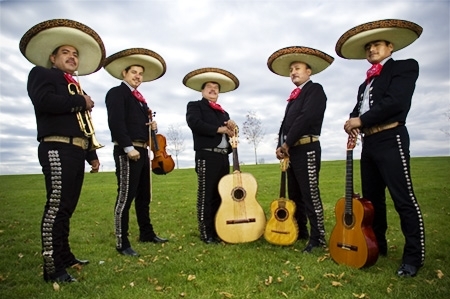 We found a mariachi that meet all our criteria and that fit our budget. A thing I found out along the way was that in Southern Cali the average rate for a mariachi is $400 an hour for about 5 musicians. You can find a decent ones for cheaper but they might not look as authentic. For example we went to see one in a “family bbq” that sounded great but since they were cheap they did not have enough money for the traditional mariachi attire. So the mariachi we went with will be playing for 2 hours and we will have 6 musicians. Meet our newest vendor Mariachi Espuelas de Mexico. We are so excited and hope that the mariachi is great and I can’t wait to tell you all about it after the wedding. Oh and all this was possible because a really close friend of mine wanted to pay for the mariachi as a wedding present to us. He is absolutely amazing and we appreciate it so much. Thanks DB! What kind of music will you be having at your wedding reception? My parenst and I want mariachis for the cocktail reception but I have not researched it yet, thank you so much for all the info! ← One more thing off the list! !